The topics to be discussed were selected specifically for their particular interest to the general public. The lecture series opens Sunday, January 22nd at 2:00 p.m. as museum curator, Andrew Phillips discusses America’s attempt to stay neutral amidst the provocations which eventually led to war. 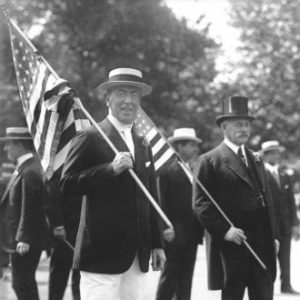 The series continues Monday, February 20th, Presidents Day, at 2:00 p.m. as WWPL CEO, Robin von Seldeneck, examines Wilson’s role in neutrality efforts and the lead up toward American involvement in the war. On Sunday, March 12th at 2:00 p.m.museum educators, Heather Sutton and Susan Laser explore the uniforms, weapons, and artifacts from their extensive collection as they depict the life of an everyday soldier during World War I as well as the preparations for war on the home front. All four events in the lecture series are free and open to the public and will take place in the Library and Research Center of the Woodrow Wilson Presidential Library located at 235 East Beverley St. Staunton. Those interested in receiving more information about the lecture series should contact Bob Robinson at rrobinson@woodrowwilson.org or call (540) 885-0897 ext. 102.